While talking with some teacher friends this summer and discussing activities we'd like to incorporate in our classrooms this upcoming school year, scoots came up. Here's a different twist if you have access to devices and Seesaw. If you're interested in getting started with Seesaw, make sure to check out THIS POST! I should also note, I also use a REGULAR recording sheet for scoot activities (I'll explain those below too!! It just depends on what we're working on and what I'd like my students to accomplish. So sometimes it's pencil/paper, sometimes it's Seesaw! Review ANY content! Scoots can be used for any content area review. Use a scoot activity as an assessment to see where students are. Scoots are always more fun that a boring old pencil/paper/at your desk/don't talk assessment. Scoots can be collaborative if you'd like them to be. Students can work in partnerships, or even in groups on tasks. Scoots can be easily differentiated. For example, I might have three groups of students, one at grade level, one approaching, and one below. Scoots can be used as a center activity. The prep is relatively easy and once students know how to do them, you can switch out the content so they don't get bored. And my all time favorite reason to use scoot activities- MOVEMENT! Scoots get kids up and moving which can be a game changer. It brings the content to life a little more, and gets kids engaged. Especially if you "hide" ;) the task cards! It almost adds the element of a scavenger hunt to the mix when we "hide" them! And of course, if you're using Seesaw, it'll make STUDENT THINKING VISIBLE! Recording sheet. Students each need a recording sheet. This usually looks like a grid or table with numbers (one number for each task card.) When I'm not using Seesaw, I always have kids put these on a clipboard so they can easily walk around the classroom and record their thinking. If you're using Seesaw, Seesaw will actually be your recording "sheet" and you won't have to actually prep anything for students- just the task cards. This recording sheet is from Bright Concepts 4 Teachers and the math problem is from my Seesaw Pumpkin Challenges pack. Now you can do this in lots of different ways! That's the beauty of it! Do what works for you and your students! I'll explain two ways below! 2. Teach students how to walk around the classroom quietly and match the problem with the spot on the recording sheet. For example, if a student finds card #5, they would place their answer or response to card #5 in box #5 on the recording sheet. 3. Students continue to walk around and complete activities or problems. 4. If they finish early, I always tell them to see if any friends need help. 1. Find a task card. 2. Press the green plus sign in Seesaw. 4. Use the Text tool or the Pencil tool to add the number of the task card. *Make sure to explicitly state this!!!! 5. Press Record and complete the problem or task. 6. Upload your work with the green check mark. Here's a quick video on how to use the Drawing tool to complete a task during a scoot. And here's a quick video on how to use the Photo tool to complete a task during a scoot. 1. Students each place a task card at their desk. 2. Decide on a set amount of time for each problem (anywhere between 30 seconds to 2 or 3 minutes depending on the task and how much time students might need to complete it). 3. Start the timer. Students begin working on their problem at their desk. 4. When the timer goes off, students "scoot" clockwise (or counterclockwise- whatever you want. Just make sure to teach students how to do this first!) to the next task card and begin working on that one. 5. Make sure to explicitly teach and remind students how to match the problem with the spot on the recording sheet. 3. Students begin a new upload in Seesaw (green plus sign, and either Photo tool or Drawing tool). Explicity teach students how to add the number of the task card to the upload using the Drawing tool or Text Label tool. 3. Start the timer. Students begin working on their problem and recording their thinking. 5. Make sure to explicitly teach and remind students to add the number of the task card onto the Seesaw upload using the Drawing tool or Text Label tool. 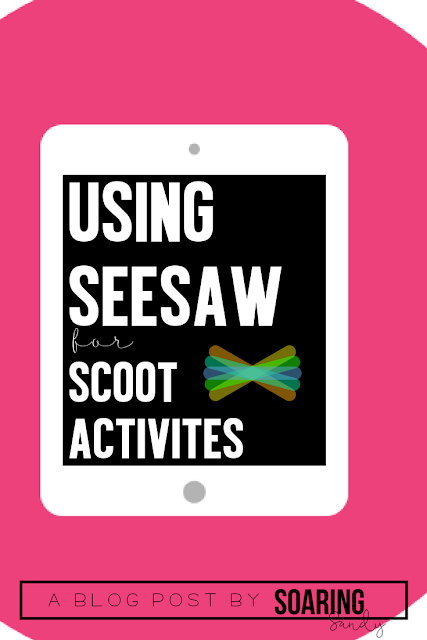 I love the idea of Digital Scoot activities from Erin at Erintegration! If you have access to devices, these might be for you! Make sure to check out her blog post about them! Do you Scoot in your classroom? I'd love to hear about it! Assessment time in the classroom. Every teacher's favorite. JK. We became teachers to TEACH, right? Not assess! But it's something we have to do, and many districts mandate specific assessments at certain times of the year. Not to mention, it's good to have something tangible and some legit data to share with parents and while doing report cards. This is where Seesaw comes in, and can be a serious game changer for administering, reading, and document student assessments in the classroom. Seesaw is a Digital Learning Portfolio for students. I feel funny typing that, because it's truly SO much more, and has the ability to help you flip your classroom, to create a student centered classroom, to break down the walls of your classroom to connect with other classes around the world, to allow your students to connect with each other and their families which gives them an authentic audience, to turn your students into bloggers, and SO. Much. More! You'll see samples throughout this post! I guess this should be titled WHY NOT!? 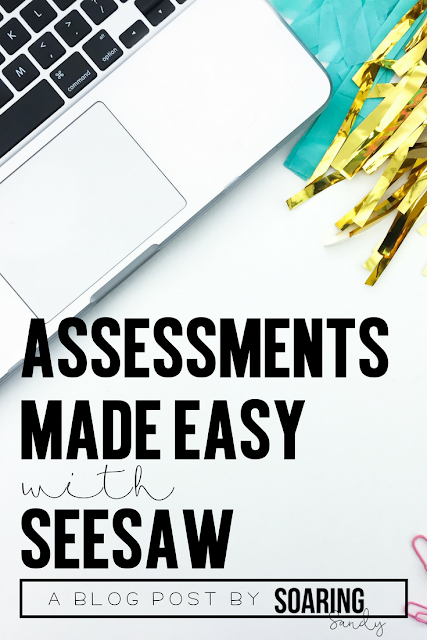 If you have access to any number of devices in your classroom, EVEN if you're not 1:1, Seesaw can still be a game changer when it comes to administering, evaluating, and grading assessments. By allowing students to work through assessments in Seesaw, it saves me the time of having to pull students one on one, and sucking up a ton of teaching time. I can assign an Activity in Seesaw, or have students move through a center in which one of the centers is an assessment challenge. By using Seesaw, it captures that specific moment in time. Now I don't have to sit one-on-one with every single student, because I can have them working simultaneously on assessment challenges, then I can revisit them at a later time! This is a game changer for sure. I can easily differentiate assessments in Seesaw too. I can assign students the same task in Seesaw, but I can differentiate the problems and content depending on my students and their needs. Below is an example I've used in math. I needed to know if students understood how to add with regrouping. I had three groups of students- one below grade level (Group 1), one at grade level (Group 2), and one above grade level (Group 3). Each student was assigned a group, and knew which assessment Challenge to complete to show their understanding of the concept. The great thing about this is after I reviewed the work, if I noticed a student who did really well on their challenge, I may have him/her try the next problem. Same concept, just differentiated with different problems. The samples that students produce in Seesaw make student thinking VISIBLE! That moment in time and whatever that students knows is captured in Seesaw. And I can revisit it ANYTIME. Even from the comfort of my couch at home! Seesaw can also be a HUGE help during parent-teacher conferences. Instead of saying, "Yes, little Billy is doing great!" and smiling, I have EVIDENCE of little Billy's thinking to share with parents through Seesaw. And vice versa... I know I've never been in meetings with parents where they say, "Joey is so good at reading at home. I don't know why he acts like he can't read with you..." #yeahright With Seesaw, I have evidence of the thinking and learning happening in the classroom. These Assessment Challenges are my go-tos, and I use them more often than any other of my Seesaw Challenges. I decide on the content I place in each Challenge, and they can be used over and over, across content areas. There are so many ways to assign these challenges too! 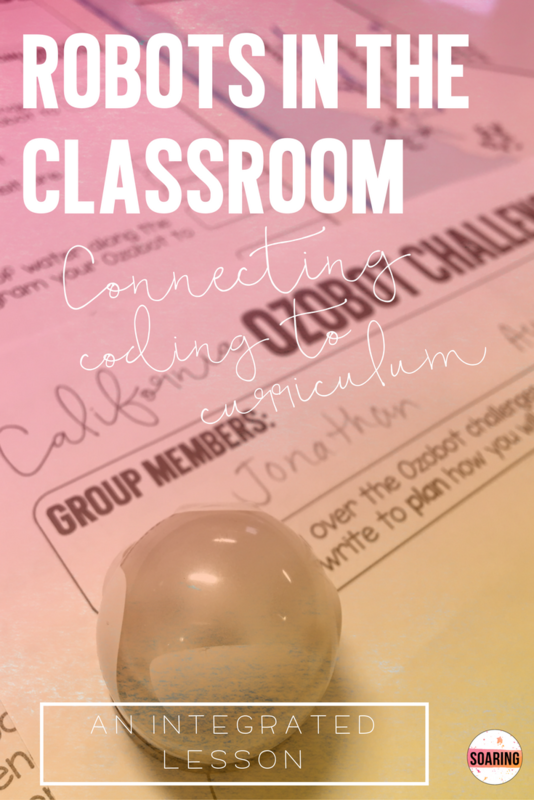 Hang them up around the classroom and have students move through them at their own pace, like a Scoot activity. Have them at a center for students to complete. Have students work on them with a partner or in a collaborative group. Have a parent volunteer work with students on these. 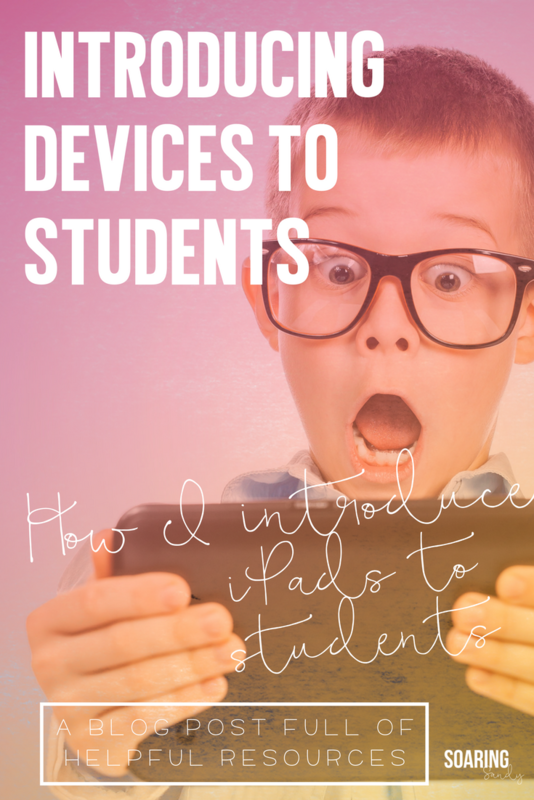 If your students take devices home, they could work on them at home. Have students work on them at the teacher table during group time. Use them as early finisher activities. Just like everything else in Seesaw, the possibilitie are endless! Don't forget- it doesn't have to be fancy. It can be as simple as a student taking a photo of something they've completed, and using the recording tool to reflect and explain. If you only have a few devices and your students are sharing devices, using Seesaw to give assessments will still work! Seesaw makes it so easy to move between students (the iPad is signed in to the class one time, and anytime a student clicks the upload button (green plus sign), it will have the student choose his or her name from a list). The devices and assessment activities can be placed at a center, where students work through them in small groups. You might place the assessment Challenges at the teacher table and work with students through them together (or independently while you're sitting there with them). If you have access to a parent volunteer, this might be another option! Have the parent volunteer call students over one at a time to complete the assessment challenge. Having the parent there can be helpful because the volunteer can keep students on task, read directions, and help students troubleshoot and answer questions. Once the students have uploaded their assessment to Seesaw, you will be required to approve it before any other students or parents can view it. Simply do not approve these assessments. The work will remain in the student journal, and you will still be able to access the work at any time- it just will not be visible for other students or parents to see until you approve it. 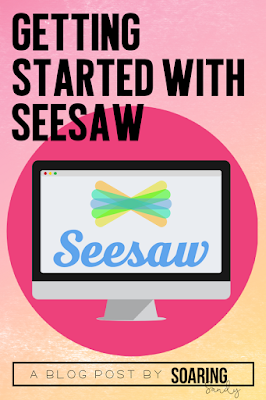 Ready to get started with Seesaw? Check out THIS post! This is always a favorite project to do with students (both for teachers and students!) because it lends itself perfectly to creativity and there are lots of different ways you could go with it. The possibilities for writing, evaluating, forming an opinion, and learning more about your students are truly endless with this project. And administrators- this would even be a fun project to completed with your staff! Check it out! Projects like these allow our students to be creative. 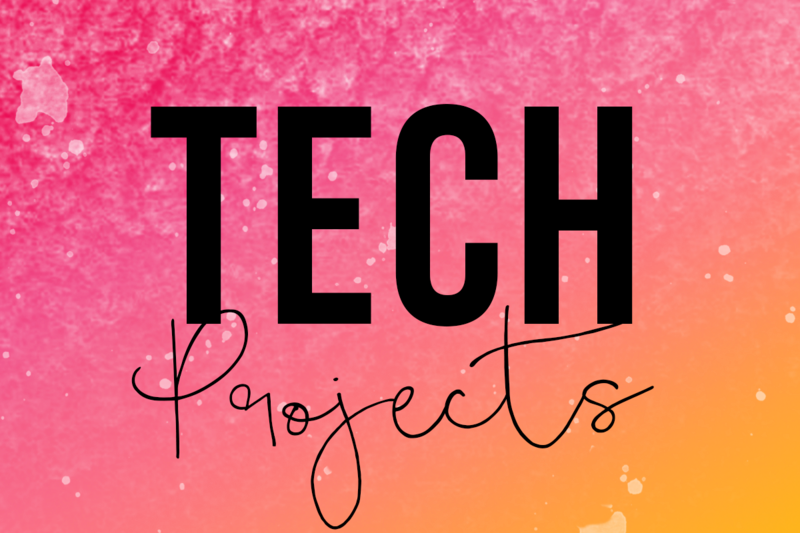 It gives them choice in their learning (in the quote they choose, and the actual creation of their project) and students feel a sense of pride in their work. No projects will turn out exactly alike, even if students choose the same quote. The critical thinking component is apparent when we ask students to evaluate the quote they've chosen and to dig a little deeper into it's meaning. We can also ask students to make connections to the quote, and write a narrative about how the quote impacts them and why they chose it. The possibilities with this project are truly endless. Take a selfie or have a friend take a picture for you. 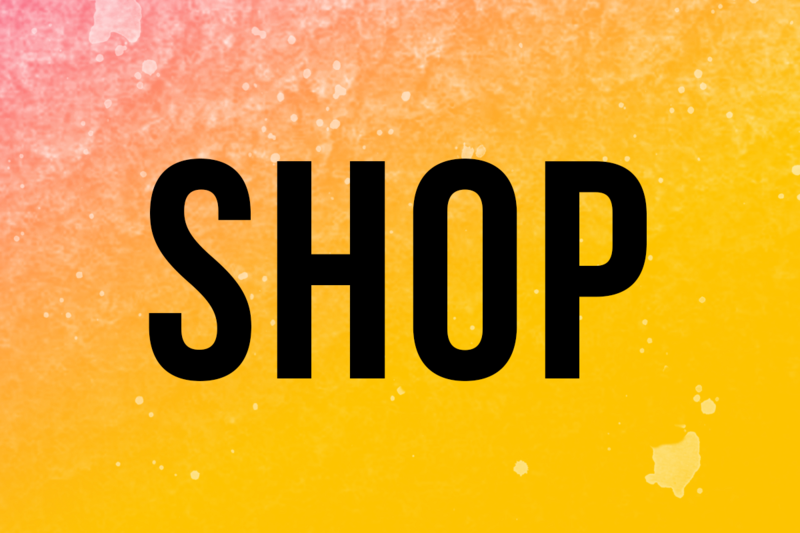 Launch an app that allows you to layer Photos and Text. 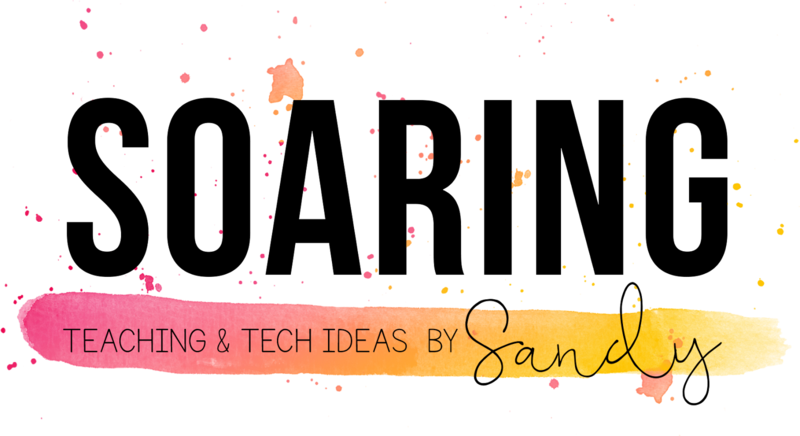 Pic Collage, Seesaw, Google Slides, or Phonto are some on my favorites. Add your quote to your photo. Have fun stylizing and editing. Just make sure your quote is easy to read for others (you can always go back and make a fancy hard-to-read one if you want later)! Don't forget to save your quote project to your device. Feel free to share this video with your students as well- it's a step by step video. Now that students have created these beautiful inspirational quote projects, the big question to ask is- What will you do with them now? Print them out? Hang them on your wall? It surely would make a nice bulletin board! Turn them in to Google Classroom? But then what? But how do we take it one step further? How are we sharing student work with the world to inspire others? Twitter? A class blog? Class Instagram account? Seesaw? Print them out to hang around the school and inspire other students? I challenge you to make sure you aren't missing this last step, because it oftentimes gets overlooked, and it may possibly be the most important and motivating step for our students. Giving students an audience for their work is essential. Have you heard about Seesaw? Are you wondering how to get started? I'm here to help you and your students! Seesaw is a Digital Learning Portfolio for students. I feel funny typing that, because it's truly SO much more, and has the ability to help you flip your classroom, to create a student centered classroom, to break down the walls of your classroom to connect with other classes around the world, to allow your students to connect with each other and their families which gives them an audience, to turn your students into bloggers, and SO. Much. More! First, you'll want to decide on the Settings for your class in Seesaw. Check out this video to get started. If you're ready to get started, first you'll download the Getting Started Challenges for your students here. These Challenges are designed to get you and your students familiar with the upload tools in Seesaw. This is how the students upload their awesome work to their learning journal! Once you're familiar with these, the possibilities for you and your students are truly endless! Challenge #6 (This is if you and your students are using G-Suite apps in your classroom). You might also be interested in learning how to create Folders in Seesaw to keep the Challenges organized! Now you're ready to introduce the Challenges to your students. You can introduce the Challenges one at a time with your students. I've found this works well for younger students- I model, then they try it out. Then I introduce another challenge, model it, they do, etc. until they've gotten through all of them. 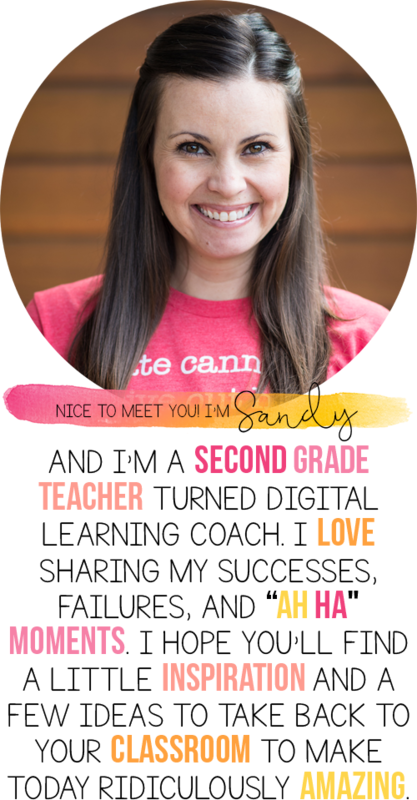 Make sure to check out the other Seesaw Challenges available in my Teachers Pay Teachers store! I also post Instagram stories on Seesaw often (that's where all of those videos came from!) so make sure to stop by and say hi there! You can also stop by my YouTube page where I upload the Seesaw videos as well! Do you have questions? Ideas? Please leave a comment! I'd love to hear how you are using Seesaw in your classroom! 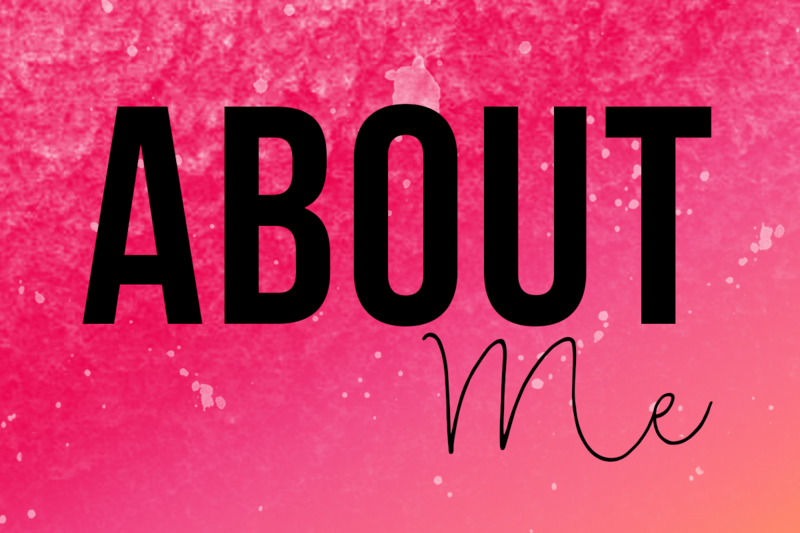 And if you're not, I'd love to help you get started! Just let me know how! We all know that research is unclear on the benefits of homework. Does it really help kids? Does it create even more of a divide between socioeconimical classes? Is it really worth it? Are you giving meaningful feedback on all homework you assign? Are students actually learning anything from doing it? I just started reading Ditch that Homework by Matt Miller and Alice Keeler and I cannot agree more with their points about getting rid of homework. They bring up points about equity for all students (since not all of our students have the same resources and help available at home), stress and family fighting (because homework can be a huge cause of this- have you experienced it with your own kids??? ), academic benefits being minimal, cheating (have you ever had a student turn in a homework assignment completed in a parent's handwriting...??? ), homework being difficult to truly differentiate, and finally how it can reduce the love of learning. The idea behind the FlipGrid Family Book Club is to STOP assigning pointless homework (I'm guilty of this too if we're being totally honest!) and to get students and families (near and far!) READING together! How wonderful would it to be actually have students reading awesome books, involve families (even if they live hundreds of miles away) in the reading, and have an authentic conversation about the text!?!? Here's how to set this project up! Choose a book and make sure all of your students have access to the book. It can be any book. Chapter books will work best, but for younger students it could be picture books. You could even do an author study throughout the month. For example, "In April our author study will be in Peter Reynolds. Week 1 we'll be reading The Dot. Week 2 we'll be reading Ish. Etc." Break the book up into sections and decide which chapters (or books) you will read each week. I've found it's easier and more manageable to do "chunks" per week. For example, Week 1 read Chapters 1-5. Week 2 read Chapters 6-11. etc. vs. Read Chapter 1 on Monday, Read Chapter 2 on Tuesday, etc. This allows for more flexibility on the family and student's parts. Create one Topic on your Grid per "chunk" of the book. You're going to repeat this last step step for each "chunk" of the book. I have broken the book into five chunks, so I'll be creating five topics for the grid! Create a calendar. 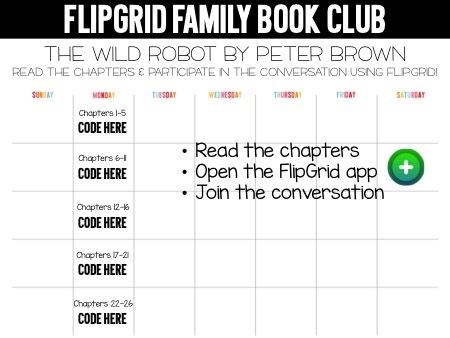 Include the chapters to read, and your Grid/Topic codes from FlipGrid. Here's what will happen when students and families begin responding. Assign this as student homework, make it an optional activity, or it can even be more flexible if you'd like. 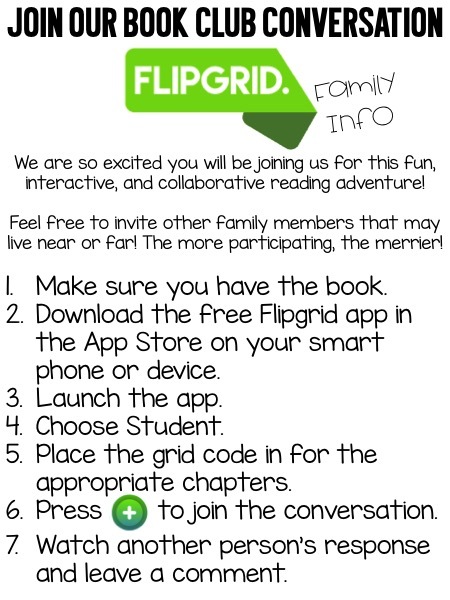 It can be a class read aloud, and students can respond to the FlipGrid at a center or as an early finisher activity. The key is to get families involved, to get students excited about reading, and to get families talking about the reading WITH students!!! It would even be fun to invite administration, principals, board members, the student's previous teachers from past years, and anyone else you can think of! Why not even open it up to the entire school? 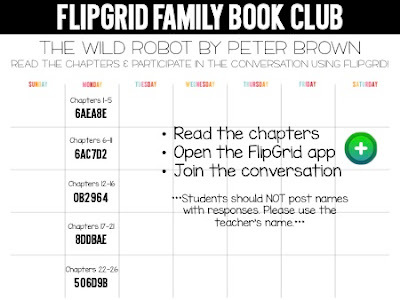 If you're interested in reading and responding to the Wild Robot, we'd love to have you and your class contribute to the Wild Robot Grid! Feel free to use these codes with your students to add their responses! 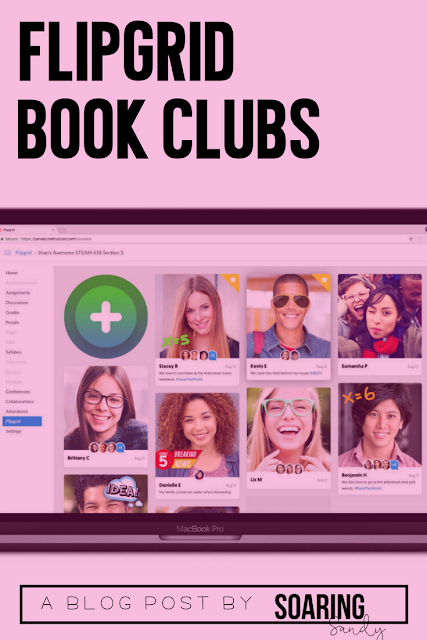 Do you use FlipGrid in your classroom?! I'd love to hear about it! We are so incredibly lucky to have sets of Ozobots to take out to classrooms to work with students with. Ozobots are small, one inch robots that students can program using block code or markers. The Ozobots can move in different directions, light up different colors, and do fun moves like zig zag, spin, and skate. Of course, the Ozobots are fun and all and students are completely engaged anytime we pull them out... However, how are we tying this "fun" to the curriculum to make sure students are learning and that the coding is tied to the curriculum? Regardless of which type of robot you're using, this question always sticks with me as I work with teachers to plan lessons and units.